Lyla Goldman, Anna Zuckerman, and Leah Zuckerman have worked together as members of SANCA’s Cirrus Circus for over 7 years. They’ve performed in countless shows throughout the Seattle area and have taken their act to youth circus festivals in London, Wales, and Sylt, Germany. 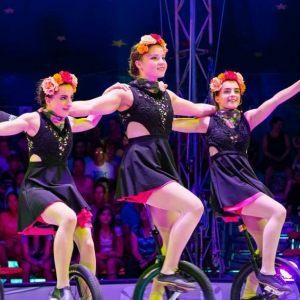 This past summer they toured with Circus Smirkus (an award-winning international youth circus based in Vermont) performing acrobatics and aerial and showcasing their marvelous unicycle skills, and they look forward to touring with Smirkus again this summer. Together they will perform a trio unicycle act appropriately referred to as TRIcycle. We are so happy to have these charming young Seattle women join us this year at Moisture Festival.